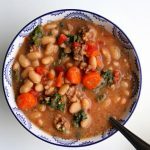 Dried white beans are quickly pressure cooked and make an amazing soup with Italian sausage, carrots, tomatoes, kale and parmesan cheese. The flavor is unbelievably good! This soup is naturally gluten free. Turn your Instant Pot to the saute setting. When the display says HOT add in the Italian sausage and break it up (I use this tool*). Add in the onion. Stir every minute or so until sausage is browned. Pour in the broth and deglaze the pot. Add in the carrots, beans, garlic powder, Italian seasoning and bay leaf. Cover the pot and secure the lid. Make sure the valve is set to sealing. Set the manual/pressure cook button to 40 minutes (for beans that have not been soaked) or 20 minutes (for soaked beans) or 5 minutes (for canned beans). When the time is up let the pot sit for 5-10 minutes and then move the valve to venting. Remove the lid. Discard the bay leaf. Stir in the tomatoes and kale. Ladle into bowls and top each bowl with a heaping tablespoon of parmesan cheese. I used my 6 quart Instant Pot Duo 60 7 in 1*. An 8 quart pot would also work great with this recipe. You’ll have to halve the recipe if using a mini Instant Pot. If you use the canned beans you won’t need as much broth. 5 or 6 cups of broth will suffice. Dried beans can’t be cooked with acidic products like tomatoes or else they won’t get soft. That is why the tomatoes are stirred in after the dried beans are cooked. If you’re using canned beans you can stir the tomatoes in initially. Dried beans vary in cooking times depending on how fresh they are. If your beans are older they may take longer to cook. I bought a fresh bag from the store and they still took 40 minutes to cook. Soaking your beans for 8 hours in water will help with digestion and possibly give the beans a better texture.